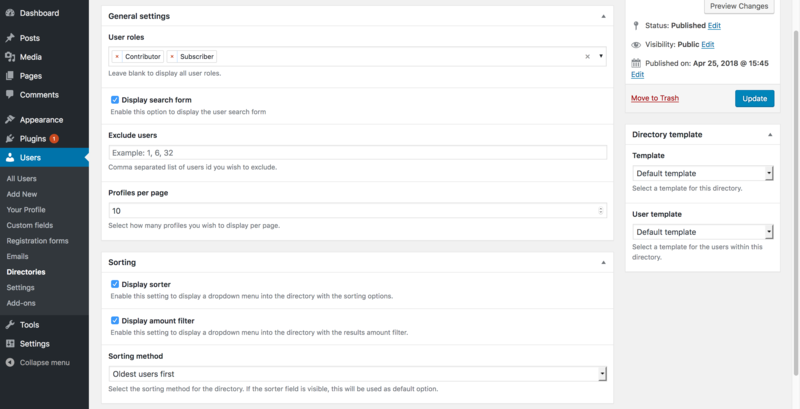 When creating or editing a directory, the "General Settings" panel contains settings that allow you to specify the grouping criteria for your directory. This option allows you to specify which user roles will be displayed into your directory. Click into the "user roles" input field and a list of user roles on your website will appear. If left blank, the directory will display all users from all your user roles. From the list you can select as many roles as you want. If you wish to exclude specific users from appearing into a directory, you specify the user ID(s) number(s) into the "Exclude Users" setting. To find the ID number of a user registered on your site, navigate to "Users -> all users". In this screen a new column has been added by WPUM which displays the ID number of the user. Now that you have the user ID, you can add them into the directory settings panel. To exclude multiple users separate them with a comma like into the screenshot below here.